These hooks fit both the Clear Tape Hangers and the Stainless Cable Hangers. Slack off the screw and feed the end of the clear tape (or Stainless cable) through the hook body. 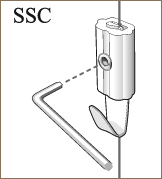 Slide to the required position and tighten with the key provided. 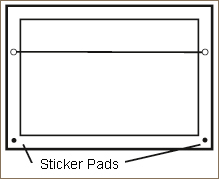 Stick one of these adhesive foam pads near the lower corners at the back of each frame.They help stabilise the frames and keep them straight. 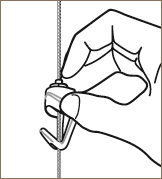 Fit the stainless steel cable into the top of the hook, pressing down as shown. While the button is down the hook will move freely on the cable. The hook grips the cable when the button is released.